Another year, another week of celebrating my birthday, and another Disney World dining update. 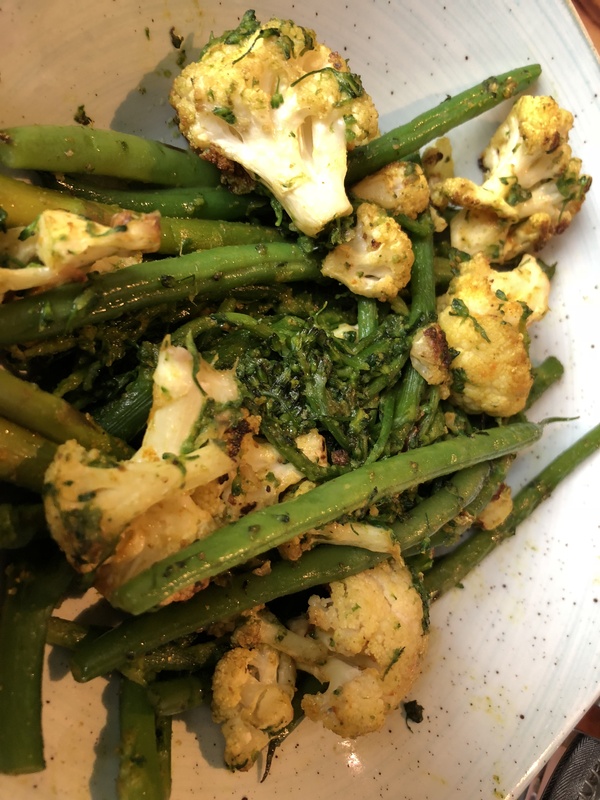 Once again, the 2019 edition contains my reviews of visits to old favorites, along with new restaurants that I discovered were more than capable of handling gluten-free and vegan eaters. 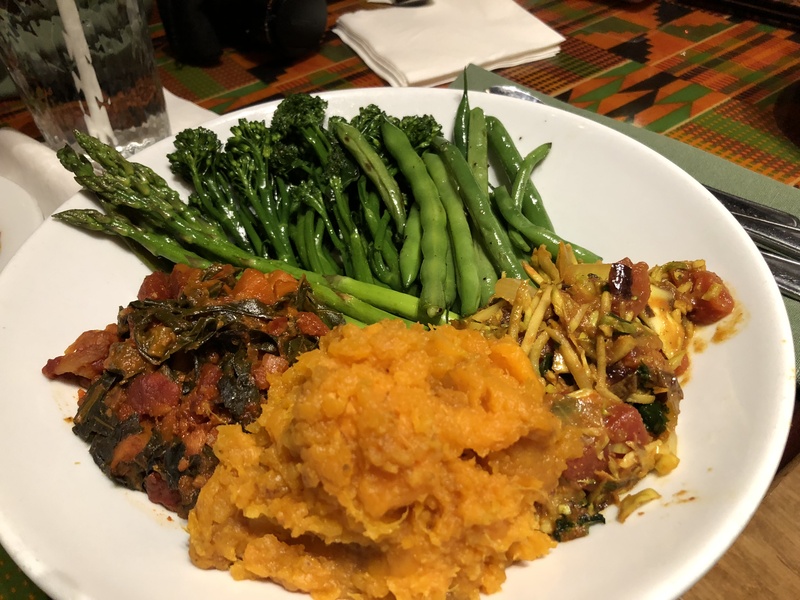 I’m happy to report it seems like restaurants – in what has always been one of the best places to travel with specialty diets – are even more prepared to cater to celiacs and plant-based patrons alike. As I write this, I’m reflecting upon my nine-day smorgasbord of food and must admit that I wasn’t looking forward to this Disney World trip as I have always done in previous years. Now, after eating my way through Epcot, Hollywood Studies, Animal Kingdom, and the Animal Kingdom Lodge, I cannot understand why I wasn’t excited for this vacation, especially as the weather has been sunny and hot and a great relief from the frigid Michigan weather. 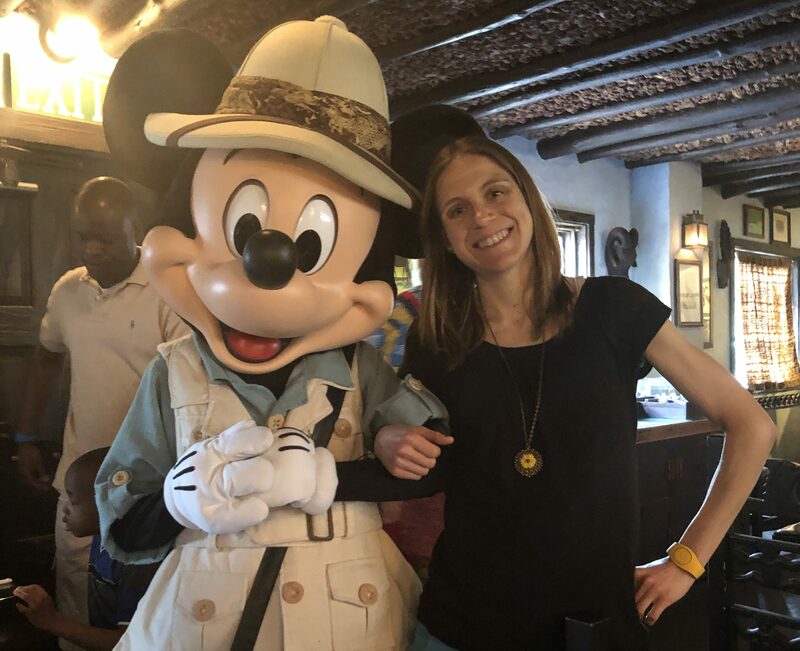 Disney World remains a go-to destination for celiacs, vegans, and others with specialty diets who want to feel like the waiters, chefs, and restaurants as a whole are happy to make food they can enjoy safely. Once again this year, I’ve had to split my 2019 Disney World travel destination update into two parts. This first part includes my experiences dining at Boma, Chefs de France, La Hacienda de San Angel, and Sanaa. Part two will cover 50’s Prime Time Cafe, Mama Melrose’s Ristorante Italiano, Tusker House, and Jiko. Be sure to check out my 2018 Part I, 2018 Part II, 2017 , 2016, and 2015 Disney World updates, too. Oh, Boma. Never do I leave here without what’s been dubbed the “Boma Coma.” It’s the term used to describe the feeling you have after consuming massive amounts of food from the African-inspired buffet inside the Jambo House at the Animal Kingdom Lodge. Since I can’t eat from the actual buffet line (out of the risk of cross contamination), the wonderful and talented chefs always personally prepare me enough food to feed an army to ensure I don’t miss out on the Boma Coma. 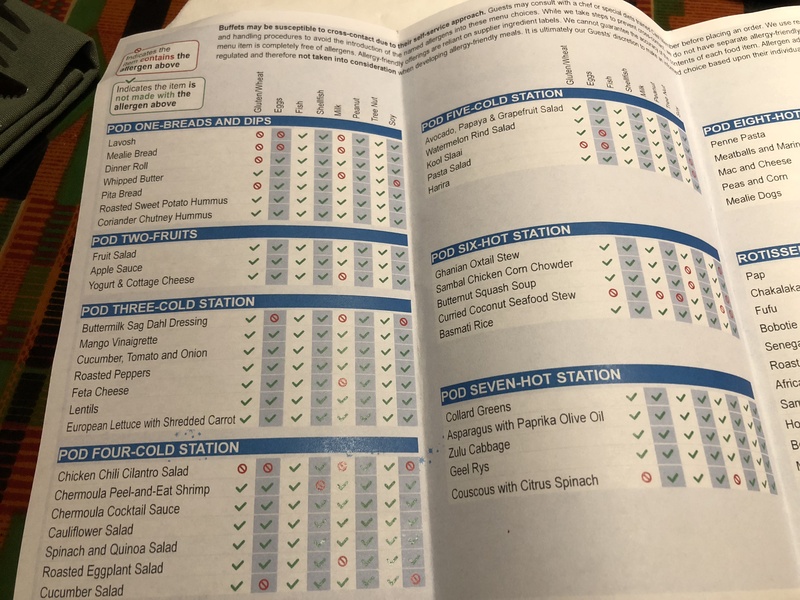 As with every buffet you’ll go to at Disney, as a guest with a food allergy, you’re presented with the allergen menu and are asked by your server if that will be sufficient or if you’d like to talk with a chef. Pro tip, ALWAYS talk with a chef. They have lots of other items (vegetables, grains, sauces) that aren’t even featured on the buffet. This year, I was fortunate enough to have Chef Pamela help create my Boma meal. We started off by walking the buffet. In past years, there haven’t been many gluten-free and vegan items as is on the buffet line. However, this time there were many dishes that were already. These included zulu cabbage (a mixture of cabbage, shaved brussel sprouts, carrots, and tomatoes tossed in a curry sauce), collard greens (prepared with a berbere sauce), paprika-spiced asparagus, green beans, basamati rice, many different cold salads, and my long-time favorite Harira soup (a primarily lentil-based soup that is both spicy and sweet). Chef Pamela also mentioned she had yukon and sweet potatoes that she could make an olive oil mash out of. For dessert, she said they had gf/vegan cupcakes from Erin McKenna’s Bakery in Disney Springs and allergy-friendly sorbet and cookies that also were not on the buffet line. 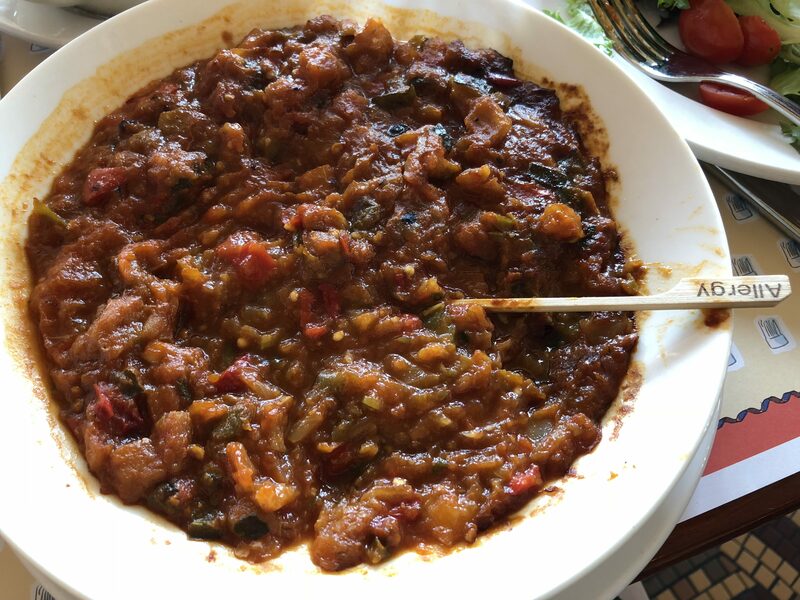 I asked for a plate of most of the vegetable dishes along with mashed sweet potatoes and a bowl of harira. Chef Pamela said it would be her pleasure and went in the back to make me my dinner. It arrived about 15 minutes later and was absolutely delicious. Even though she gave me a ton the first time, she came back to see if I wanted more. I thought the zulu cabbage and collards were great and asked for more of those. It was an all-star dinner. Because Boma is too good to eat there only once per visit, I dined there again on my last night in Orlando. Chef Pamela was on duty and ready to make me “whatever I wanted.” I had a repeat of the first dinner, even though those items were not on the day’s buffet, but requested an eggplant dish as well since that was what I was craving. I asked her to mimic the flavor profile of baigan bartha, a favorite Indian eggplant dish of mine, and she delivered. I can’t say enough good things about Boma, Chef Pamela, and even our waiter Lucious who kindly took care of us on both visits. I haven’t been to Chefs de France at France in Epcot in a few years. Last time I was there, they made me a giant red pepper stuffed with ratatouille surrounded by roasted veggies and olive oil mashed potatoes prepared by a particularly creative chef. This time, however, I was not given the option of speaking with the chef about my lunch, even though I expressed wanting to several times. Instead, our waitress relayed my order to the chef and came back to say everything was good. I asked for a bowl of the ratatouille (the only gf/vegan on the menu), a garden salad, and roasted veggies on the side in place of a dessert since we were on the Disney Dining Plan. I also inquired whether there was any form of protein (bean/legume) that they could serve me, which turned out to be a no. In hindsight, I should’ve been more persistent about requesting to talk with a chef. 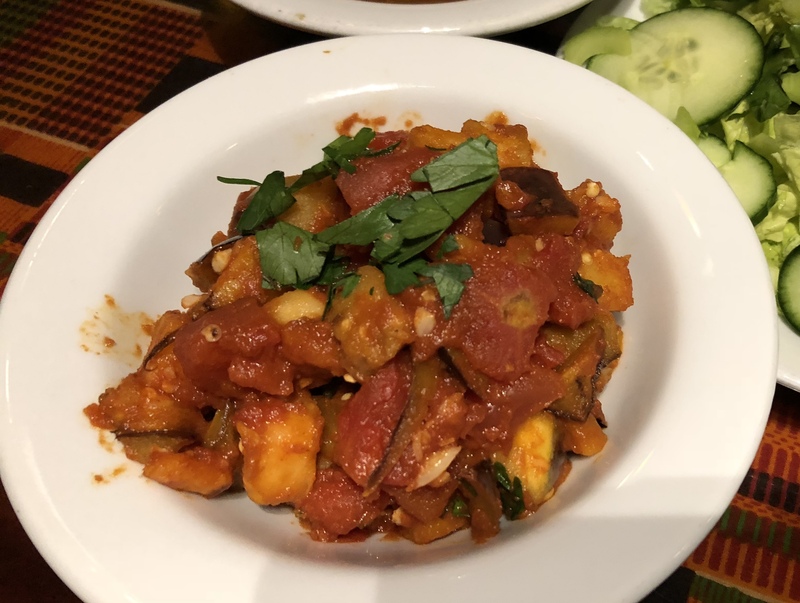 The giant bowl of ratatouille was great (although it took over an hour to arrive) and the veggies – when they finally arrived some time after the ratatouille – were good for what they were. It wasn’t quite a complete meal, but it was quite flavorful. I’ll be back again to see if a different waitress/chef combo will yield better results. This was my first time dining at La Hacienda de San Angel. To be honest, I thought I made reservations at the wrong restaurant. La Hacienda is not the dimly lit San Angel Inn, but rather a fabulous, modern restaurant located outside of the main Mexico building overlooking the water. Where the Inn is dark, La Hacienda is light and airy. The food also is super fresh. Unlike many different places, La Hacienda does not have a dedicated allergen menu but does mark vegetarian and gluten-free options on the main menu. When we were seated, our waiter Enrique greeted us warmly and after seeing my allergies, immediately went and got Chef Phil. Going over the menu, Chef Phil pointed out all the gluten-free/vegetarian-marked dishes that could easily be made vegan by omitting the cheese. Two of the main dishes were vegetable tacos and vegetarian enchiladas. Both are made with corn tortillas. I voiced initial hesitation at the corn tortillas, as many are made in shared facilities, but chef eased my concerns saying that they make them in house in a separate area of the kitchen. Since I haven’t had enchiladas in I don’t know how long, I eagerly opted for them with black beans (minus the cojita cheese) and extra veggies. The house rice also is vegan and is another option. I was overwhelmed with choices! Not something I’m used to. The food arrived relatively quickly. Compared with our earlier lunch at Chefs de France, it seemed like no time at all. The enchiladas were fantastic! My only complaint would be for more of the red enchilada sauce because it was that good. In addition, you could tell the tortillas were homemade and the veggies were the peak of freshness. I devoured the entire plate and the two sides. 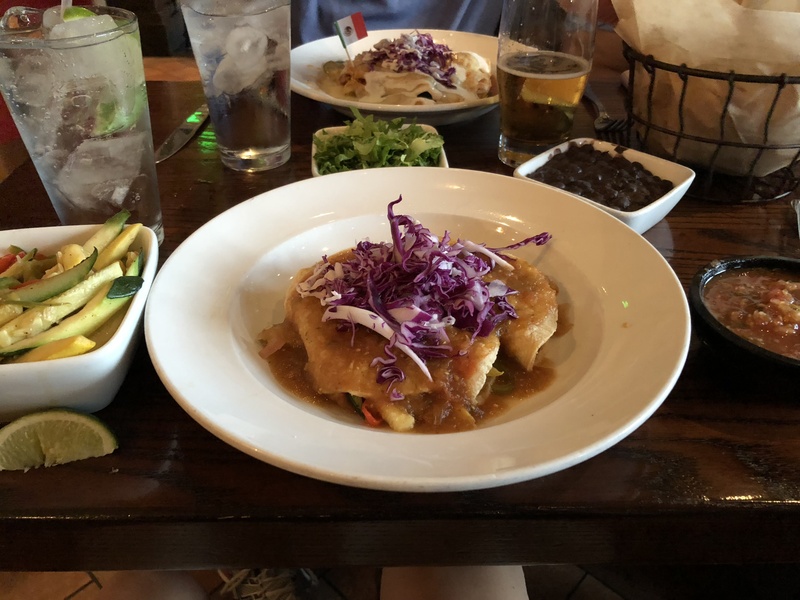 If you are looking for a fine-dining, sit-down restaurant at Epcot, you have to try La Hacienda de San Angel. You will not be disappointed and I’ll definitely be back the next time I’m there. I’ve been to Sanaa inside Animal Kingdom Lodge’s Kidani Village once before. It was a few years ago, but it was a great experience. Sanaa is one of the coolest restaurants because its windows look out on the savannah that surrounds the lodge so you feel as if you’re dining with the peacocks, giraffes, gazelles, and other animals. For lunch, the only vegan/gluten free option listed on the allergen menu as a main course is the chickpea wat with basamati rice. Since you get three picks for that meal, it means extra rice or chickpeas. There is allergen-friendly naan and various dips that are vegan for an appetizer. If I was more hungry, I might have tried that. Per usual, I asked to speak with the chef. An assistant chef came out and asked what I’d like. 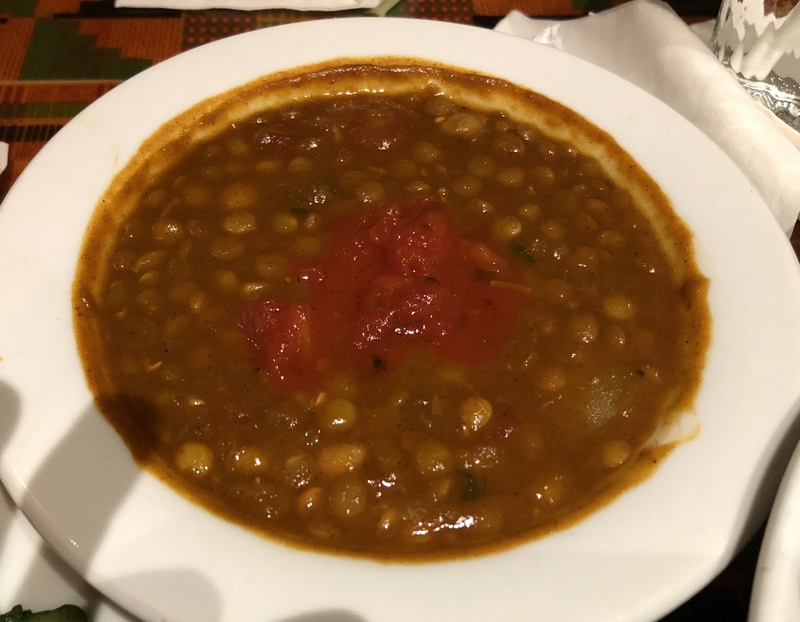 Having my fill of chickpeas, I inquired about having the berbere black eyed peas served over sauteed greens and a side of curried vegetables with a salad. The chef said no problem. It took a VERY long time to get food. Nearly an hour and a half. However, when the food did arrive, the curried vegetables were out-of-this-world amazing. 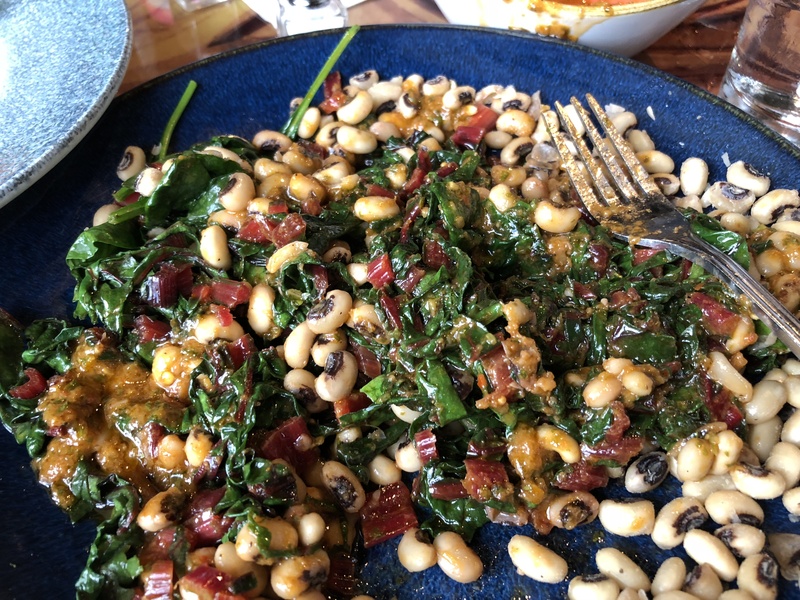 Unfortunately, the chef missed by desire for the “berbere” black eye peas and instead threw plain, extremely dry peas over the perfectly sauteed greens. When I asked for sauce, the chef returned with a large bowl of berbere sauce. Mixed with the black eyed peas and greens, it was tasty. Given the fact I requested a special dish, I don’t blame the chef for not getting it right, and my lunch was good. I wasn’t sure what took so long to make a dish that I could make myself in under 15 minutes, but it isn’t enough to turn me off from dining at Sanaa again. My family didn’t love their food either. I’d be very cautious about eating here with people opposed to a lot of spice, as everything seems to be pretty spicy.